A fresh look at President William McKinley from New York Times bestselling author and political mastermind Karl Rove—“a rousing tale told by a master storyteller whose love of politics, campaigning, and combat shines through on every page” (Doris Kearns Goodwin, Pulitzer Prize–winning author of Team of Rivals). The 1896 political environment resembles that of today: an electorate being transformed by a growing immigrant population, an uncertain economy disrupted by new technologies, growing income inequality, and basic political questions the two parties could not resolve. McKinley’s winning presidential campaign addressed these challenges and reformed his party. With “a sure touch [and] professional eye” (The Washington Post), Rove tells the story of the 1896 election and shows why McKinley won, creating a governing majority that dominated American politics for the next thirty-six years. McKinley, a Civil War hero, changed the arc of American history by running the first truly modern presidential campaign. Knowing his party needed to expand its base to win, he reached out to diverse ethnic groups, seeking the endorsement of Catholic leaders and advocating for black voting rights. Running on the slogan “The People Against the Bosses,” McKinley also took on the machine men who dominated his own party. He deployed campaign tactics still used today, including targeting voters with the best available technology. Above all, he offered bold, controversial answers to the nation’s most pressing problem—how to make a new, more global economy work for every American—and although this split his own party, he won the White House by sticking to his principles, defeating a champion of economic populism, William Jennings Bryan. Rove “brings to life the drama of an electoral contest whose outcome seemed uncertain to the candidate and his handlers until the end” (The New York Times Book Review) in a “lively and…rigorous book” (The Wall Street Journal) that will delight students of American political history. On July 24, 1864, a twenty-one-year-old Union first lieutenant was sent on a suicide mission near Kernstown, Virginia. An officer in General George Crook’s Army of the Kanawha, he was ordered to ride across an exposed battlefield swept by Rebel musket and artillery fire and tell the men of the 13th West Virginia to withdraw before they were overrun and cut to pieces by Confederates under General Jubal Early, who were close to splitting the Union left. If the Rebels succeeded in driving Union forces out of the Shenandoah Valley, they might threaten Washington, D.C., further erode Northern support for the war, undercut Lincoln’s reelection, and strengthen the South’s chances of ending the conflict through a negotiated settlement with a politically divided North. SOME HISTORIANS WRONGLY CREDIT McKinley’s winning the White House in 1896 to Marcus Alonzo “Mark” Hanna, a wealthy iron and coal magnate turned political power broker. Others are content to overlook McKinley, instead spotlighting his second vice president and successor, Theodore Roosevelt. Yet in 1896 McKinley outmaneuvered the political bosses within his own party to win the Republican nomination and then defeated the Democrats’ young, charismatic spokesman for the rising Populist movement—William Jennings Bryan—for the presidency. In the process, McKinley modernized the Republican Party by attracting to it workers, new immigrants, and the growing middle class, allowing the GOP and its policies to dominate politics for the next thirty-six years. For much of the nineteenth century, the United States had been a nation divided. The period after the Civil War saw growing discord between the agrarian South and West and the industrialized North and East. There was friction between debtors worried about their mortgages and loans and the merchants, bankers, investors, and depositors who had lent them the money. There was increasing antagonism between labor and management, and profound disagreements over how the economy should be organized and its benefits distributed. All this was reflected in brutal political battles over esoteric issues like tariffs and currency that nonetheless deeply affected the lives of ordinary people. In 1896, McKinley emerged as a political leader uniquely suited for the moment. He understood and championed blue-collar voters while drawing support from captains of industry. He was from a small town in rural Ohio, but as president presided over a rapidly modernizing urban industrial power. His economic concerns appeared parochial, but he viewed them through a national lens. The last of the Civil War generation to occupy the White House, he helped unite the country after decades of division. So was McKinley a fortunate man who rose through luck and the guidance of others, as popular commentary suggests? Or was he a leader, very much in control of his own destiny, content to steer quietly but deliberately, focused on reaching goals more than on claiming credit? In fact, McKinley was a principled man with strong convictions. He was ambitious—most who attain the White House are—but for him, his ambition seems to have been chiefly driven by principles. Hanna—who had a more mangled yet somewhat similar lineage—once said McKinley received all the Scottish reticence of their shared heritage, while he got all the Irishman’s gregariousness. There was something to the remark. Hanna enjoyed politics’ jocular side, while McKinley remained personally reserved from childhood to the White House. The McKinley home was not without education or culture. The family had a Bible and, unusual for the time, a small library that included David Hume’s History of England, Edward Gibbon’s Decline and Fall of the Roman Empire, and Charles Dickens’s early works. Family members regularly read many of the nation’s leading periodicals, including Atlantic Monthly (reportedly favored by William) and Horace Greeley’s antislavery Weekly Tribune. In short, the Ohio into which McKinley was born and to which he returned after combat reflected America’s changing condition. As in many rapidly expanding economies, the influx of people and uneven growth created controversies even as they fostered prosperity and created new fortunes. These beliefs led McKinley to display courage on the battlefield on more than one occasion. Two years earlier, McKinley’s regiment was east of Antietam Creek, near Sharpsburg, Maryland, on the Civil War’s bloodiest single day—September 17, 1862. McKinley’s comrades and other Union troops went into action at 2 a.m. After twelve hours of brutal combat, they captured a key bridge and by early afternoon were over the creek, sheltered from Confederate fire, waiting to attack Sharpsburg. Worried that his men were hungry, McKinley—then a commissary sergeant—decided to act when the army’s supply train finally arrived near the front. He confiscated a pair of wagons, organized stragglers to load them with beef, pork, crackers, beans, and coffee, and recruited a volunteer to handle one wagon while he drove the other to take the food and drink to their famished Ohio comrades. Making their way along a wooded road, the men were twice ordered to turn around: McKinley’s comrades were across an open field, a killing ground raked by Confederate fire. He talked his way past the first officer and simply ignored the second. Rebel cannons opened up when McKinley’s wagon burst out of the trees and roared onto the field and toward the bridge. Comrades saw the wagon charge forward “at breakneck speed, through a terrific fire of musketry and artillery” that “threatened annihilation to everything within its range.” A cannonball blew away part of his wagon, but McKinley safely reached the cheering men of the 23rd Ohio. Throughout the war, McKinley was often in the center of action and had at least two horses shot from underneath him. His coolness under fire brought a final promotion after the Battle of Cedar Creek in the upper Shenandoah Valley. As at Kernstown, the Confederates were attacking with the hope of driving the Federals out of the valley. But unlike at Kernstown, the commanding Union general—Philip Sheridan—was not on the scene. Returning from a conference in Washington, he spent the night in Winchester, about twelve miles away. Waking to artillery fire early on October 19, 1864, Sheridan realized his army was under a major attack. The small, scrappy, bowlegged cavalryman mounted Rienzi, his giant jet-black gelding, gathered his command staff, and galloped south. Oliver Wendell Holmes Jr. once remarked, “The generation that carried on the war has been set apart by its experience.” This, too, was true of McKinley. At the war’s close, he was a twenty-two-year-old brevet major who had risen through the ranks from private. He had deeply held moral convictions and risked his life defending his country’s existence. He was a quiet but determined man with a deep, abiding faith in God, the United States, and the capacity of hard work to change the world around him. Many people passionately believed the republic’s very future depended on which party won and what policies were enacted. Campaigns were national educational efforts with lectures, debates, books, posters, and pamphlets driving home the party’s message, itself embodied in carefully drafted platforms that were widely circulated and discussed. Speeches—that era’s equivalent to TV ads as a campaign’s principal way to share its message—were particularly important, and parties covered target states with hundreds of orators. The second issue pitted manufacturers and those who worked in vital industries against consumers forced to pay more for life’s necessities, such as sugar, cotton, wool, and cloth, as well as needed manufacturing goods. This issue—tariffs—also saw those who believed in a limited and constrained government fighting those who believed in a more activist national government. Both issues were proxies for larger debates about how to grow the economy and ensure that every American benefited from it, and about what the proper role of government should be. McKinley’s Ohio was a microcosm of the nation on these issues, with an electorate narrowly divided over them, especially currency. Tariffs were the form of taxes by which the federal government funded itself in the nineteenth century and often the subject of passionate debates. Many people in the Gilded Age saw tariffs as a way to grow the economy by protecting American businesses against foreign competition. They believed high tariffs were necessary to produce a prosperous modern industrial economy and create innovation and competition. Their opponents believed tariffs reduced the spending power of every consumer, hitting farmers and rural communities hardest, and transferred money from the deserving poor to the greedy rich. Because they are taxes, tariffs have been a contentious issue since 1816, when then–House Speaker Henry Clay made them a core element of his “American System,” which sought to strengthen the new republic by promoting economic growth. The American System was pitched as “an act of national resistance” to overseas powers, a scheme that would make the United States economically as well as politically independent from the Old World. The parties could not resolve this issue because there were profound differences in their ideologies. Republicans favored an activist national government that ensured the rights of freed slaves, enabled white and black Republicans in the South to vote, made permanent the political and social gains made in the Civil War, and promoted American industrial expansion. Tariffs provided revenues that made a more energetic government possible, especially when they produced government surpluses, as they frequently did in the postwar period. The battle over tariffs reflected a much larger, anxious debate over how wealth would be distributed in an America still inventing its economy, who deserved protection in this tumultuous new world, and how the federal government should be financed. This contentious issue also added to tensions lingering from the Civil War. Depending on who was talking, tariffs either led to prosperity, good jobs, and high wages, or they eroded prosperity by robbing from the poor and giving to rich manufacturers. It was an issue that McKinley would have to master and make his own if he was to succeed in the politics of a rapidly industrializing, yet farm-rich state. The other issue dominating post–Civil War politics was the volatile question of currency, specifically the demands of an increasing number of Americans for an expansion of the money supply by minting an unlimited amount of silver coins that would be accepted for debts on the same basis as gold. This issue was similarly fraught with risk for politicians from closely divided battlegrounds like Ohio. The currency debate revolved around explosive questions of what constituted money, how much of it there should be, and who should control its creation. Over the Gilded Age, the country divided between advocates of “sound” or “hard” money based on the gold standard, and those who favored “soft” money through currency inflation. While united in backing inflation as a concept, there was disagreement on how much was necessary or how the federal government should inflate the currency. Some wanted to issue more greenbacks; others supported maintaining the Civil War level of paper money. Still others favored allowing local banks to issue notes or redeeming only some of the fiat currency. Over the postwar period, many inflationists came to believe the answer was to let all the growing riches of silver being ripped from mines in Nevada, Colorado, Montana, Idaho, and elsewhere be coined into money. Opposing them were those who favored stopping inflation and strengthening the government’s credit with a currency based on gold. These hard-money advocates argued government must retire fiat paper currency and return to gold and paper redeemable in gold. They argued if America retained its wartime unsecured paper currency, it would not attract foreign investment, manufacturers and farmers would be unable to compete with foreign producers, and inflation would erode consumer purchasing power. The greenbacks must be retired quickly to wring inflation out of the system. In other words, shrink the money supply. Inflationists were dealt a setback in April 1866 when the Republican Congress passed the Contraction Act, permitting the Treasury to withdraw $10 million in greenbacks over six months, then $4 million a month at its discretion. A recession turned public opinion against the contraction of the money supply and led to the act’s repeal in February 1868, but only after $44 million of greenbacks had been withdrawn. For the next several years, hard- and soft-money men kept debating how and how fast to repay the war debt, when Washington could resume redeeming greenbacks in gold, and whether to contract or expand the money supply. Each faction grew more determined to fight it out in Congress and at ballot boxes across America. At the beginning of his political career, McKinley cut his political teeth on the currency issue and tariffs. He straddled on currency. He believed in sound money, but like many Midwest Republicans, hoped the country could reach a balance allowing for mild inflation that relieved the problem for farmers and debtors of too little money without creating one of too much. He did not hedge on high tariffs. He favored protection as the way to create good jobs and high wages. For McKinley, the protective tariff was partly an economic issue of how America could cope in an increasingly global world. It was also an issue of nationalism, of protecting American workers and companies from unfair foreign competition. And it was a moral issue: how best to promote general prosperity and reap the benefits of a society where work was valued and safeguarded. Through the decades that followed the Civil War, McKinley understood economic issues were part of a broader fight over what kind of country the United States would be. The animating principle of McKinley’s political career was a concern for creating conditions that would allow ordinary people to rise. His combat experiences provided him with an intimate connection to Americans from all walks of life, and he never insulated himself from them. He understood the larger moral dimensions of these issues and how to explain them in ways people could grasp. This ability would help make him an important actor in the nation’s story as the United States moved toward the twentieth century’s dawn. But in April 1865, he was an army major hoping the war was drawing to a close. 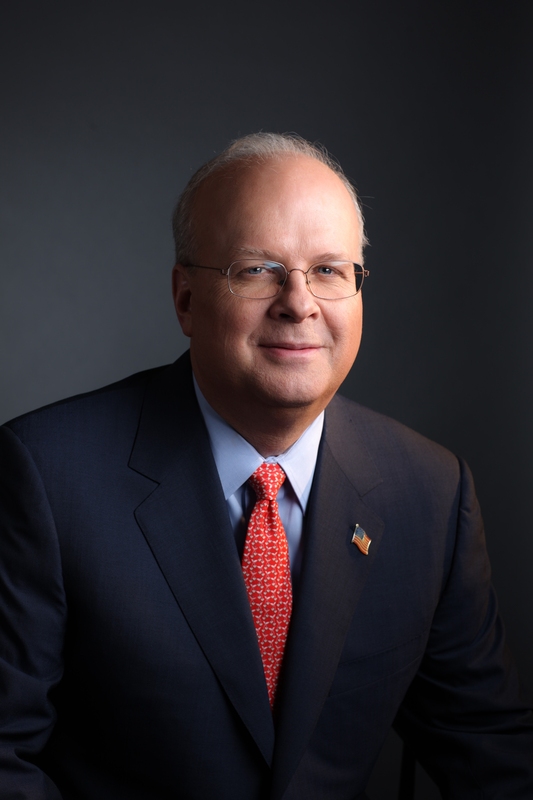 "Having run--and won--two presidential campaigns, Karl Rove knows elections. The Triumph of William McKinley is a deeply informed and highly engaging account of one of the seminal elections in American history, the 1896 victory that ushered in more than a generation of Republican dominance. A vivid, intriguing and compellingly modern rendering of one of the most underappreciated episodes in American political history." "Either politics used to be more fun or Karl Rove just makes it seem that way. Whichever, his account of the 1896 election is written with great verve, even as it is informed by thorough research and illuminated by shrewd insight. This is political history at its most engaging." "Informed by his passion for history and by his love of strategy, Karl Rove has painted a colorful and detailed portrait of an important American moment. Highly recommended!" "Karl Rove, who knows a thing or two about presidential campaigns, looks back at a watershed election over a century ago and shows how the winner, William McKinley, used it to change his party, the political process, and the nation. It's all here: the big themes, the backstage maneuvers, the personalities, the hoopla. A great read for historians, political junkies, and--in our own wild election cycle--Americans." "McKinley’s rise to the presidency is one of the major turning points in U.S. history, but it has never received the attention it deserves. . . . To help his readers understand McKinley’s accomplishment, Mr. Rove . . . must take on the herculean task of explaining the meaning of the tariff and monetary controversies to 21st-century readers. . . . Few readers will have any idea about these debates, and it is to Mr. Rove’s great credit that he brings them to life. . . . Mr. Rove’s narration of the fall campaign is lively and compelling. . . . A rigorous book that should be studied by anyone interested in following McKinley to the White House. "For guidance in understanding the twisting path to the presidency in an era of extensive change and divided government, Karl Rove makes a compelling case that we should examine the election of 1896. . . . Rove shows himself to be a sure-handed historian. He ably relates the story of McKinley's rise. . . . A gripping, blow-by-blow account [that] brings to life a late-19th-century America that is . . . eerily familiar." "McKinley, perhaps best known by Americans for the Alaskan mountain that once bore his name and the infamy of being one of the few American presidents to have been assassinated, was a vital and critical link in the history of the presidency. . . . Rove proves himself a surprisingly nimble and adept writer, juxtaposing shrewd political analysis with narrative verve. He expertly breaks down the challenges of McKinley's 1896 campaign, which he calls 'the first modern presidential primary campaign.' . . . A well-informed and -researched dissection of McKinley's overlooked influence." "[Rove's] richly detailed, moment by moment account in The Triumph of William McKinley brings to life the drama of an electoral contest whose outcome seemed uncertain to the candidate and his handlers until the end. But there is more to this book than simply recounting the details of what was arguably the country’s first modern presidential campaign. . . . The significance of Rove’s book outruns this ambition. For it implicitly raises questions about the causes of electoral success and the rhythms of partisanship. . . . All that said, as Rove demonstrates, candidates and campaigns do matter. The durable electoral and policy outcomes produced by McKinley’s victory over a dramatically dissimilar vision remind us how much can be at stake in a presidential election at a time of political polarization." "A brilliant new book on the first modern presidential campaign. . . . It’s a pleasure to read and piquantly relevant to today. . . . Rove delved deep into the primary sources and has produced a work that is meticulously researched . . . well written, and extremely discriminating with an eye for the telling detail. There are many fascinating, unjustly forgotten sagas from American political history revealed. . . . Rove provides a wonderful blend of narrative, scholarship, and knowing mastery of political campaign strategy. If you find politics, political intrigue, or American history compelling you will devour The Triumph of William McKinley." "A superb book. . . . Rove achieves something new. He elevates McKinley's status to that of a historically important president. . . . Presidential candidates who read Rove's account of how McKinley won will be wiser." "[A] fine new study of the 25th president and his election in 1896. . . . [Rove] proves a reliable guide to the machinations of gilded Age politics. . . . Much has been made of Theodore Roosevelt as the first modern president, but Rove convincingly shows that it was McKinley who helped usher presidential politics into the modern age. . . . Rove has done an admirable job of putting a historical spotlight on a once-beloved leader, reminding us that McKinley led his country into the 20th century in more than just the literal sense." "A good, brisk read. . . . [Rove] has a sure touch. " "Rove draws shrewd lessons from McKinley’s win for Republicans fighting the next general election." "This substantive book by a political practitioner will appeal to and inform all readers, especially aficionados of American political history." "An incisive look at what veteran political strategist Karl Rove calls “the first modern presidential primary campaign,” and astute advice on how the modern Republican Party could benefit from the examples set by the 1896 William McKinley campaign. . . . Rove puts his accumulated knowledge of history to use to craft a superb political read." "A fascinating glimpse at 19th-century politics." "Rove [has] feeling for the personal, human cost of politics . . . Rove reminds us that presidential campaigns were no less grueling in the era before the direct primary than they are today, at least for candidates who hadn’t sewed up the victory in advance, and he brings a professional’s appreciation to McKinley’s patient planning." "Rove’s fascination with and understanding of how the [political] process has worked throughout our history shines through in his new book, The Triumph of William McKinley: Why the Election of 1896 Still Matters." 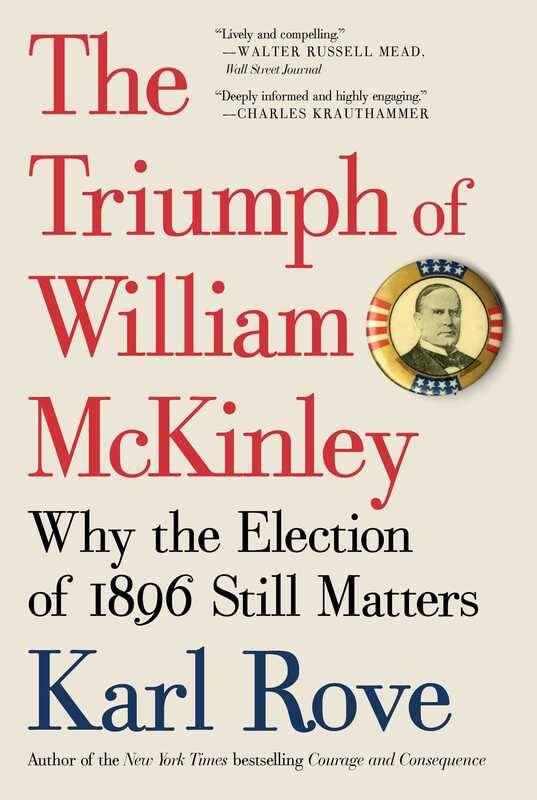 "Impressively thorough, often exceedingly well written, nearly clinical dissection of the election of 1896.... [The Triumph of William McKinley] can teach regular readers a great deal about what it takes to become president of the United States."